Mercedes And Avoids Costly Repairs. Regular Mercedes-Benz service is the most important thing you can do to avoid costly repairs and ensure that your Mercedes runs strong for a long time to come. Some people dread taking their Benz in for service because they are afraid of getting taken advantage of, but that is not the way we do business around here. Whether your Mercedes-Benz is brand new or well broken in, we can service and maintain it, but we don't stop there. We take the time to explain everything and answer all your questions. 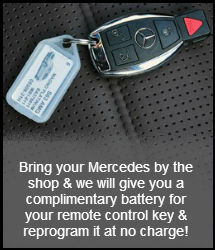 We will also remind you the nest time your Mercedes is due for service. If you live or work in the area we can drop you off while your Mercedes gets serviced and pick you up again when it's done. The Beverly Center is also near by and there are a number of nice restaurants in the area that we can take you to as well. At G&N Motors our technicians are both Mercedes-Benz and Bosch factory trained and certified. In fact we are one of the only independent service centers that is approved directly by Mercedes for SCN coding. 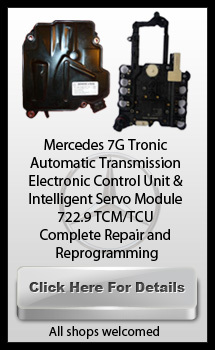 In a majority of the systems in Mercedes Benz, SCN coding is required after the replacement. These systems include; SRS airbag computer, 722.9 gearbox computer replacement, Gearbox module, SAM computer, ABS, ESP control unit, the COMAND system, intelligent headlight computer instrumentation, and ME modules, among others. All these systems require the network authorization from the Mercedes-Benz Technical Service Center for the completion of the process. Unauthorized technicians can't do this. Our service department is always kept current with up to-to-date diagnostic software and equipment. This, along with our annual Mercedes-Benz and Bosch training regimen means no matter how new or old your Mercedes-Benz, whether gasoline or diesel, we are experts at handling all your Mercedes-Benz maintenance and servicing needs.